Boats have been loaded for transport over to Rottnest Island and all that needs to be done now is to get ourselves loaded onto the ferry for our ride to the start of this years ‘Doctor’. Don’t remember much of the ferry ride as I slept for most of it, why not sleep and gain some more needed rest for the slog that was to be ahead of us. ‘The wind is swinging have a look at the flags!’ was the most common comment of the day, but was it really? I didn’t think so. The race was held up until 2pm to gain as much favour as possible from the prevailing conditions but the late start did not ease the tension that was felt by so many of the starters. The Fremantle Doctor was not going to blow today. What we had to work with was a very slight, if any cross tail with almost no swell, but as I say ‘you come prepared to race in any conditions’. On the line this year we had 3 previous winners of this race, Clint Robinson (5 time Olympian), Dawid Mocke and myself (defending champion). It was hot and flat. The best runs back across to Sorrento Beach were off the media boats that were following the race. The pace was fast, Jeremy and Clint both going for the hot spot but it would be Clint that prevailed with too much speed and power. From this point on Clint was never out of the top 4 until suffering cramps in his legs around the 22km mark. After 4km I found myself out in front with a small lead but was suffering from the high pace and heat. Clint, Dawid and Jasper all came past and after watching Clint paddle and see how relaxed he was I decided to follow suit, I relaxed and used the wash from these three paddlers to conserve my energy. From my position in the race, the only people I saw were these three other paddlers, each of us trading strokes up the front, not wanting to let the others escape out from this pack. The race was shortened due to the unfavourable conditions but it would still be 26km that we covered to get to Sorrento. The racing up the front was tight, if Dawid or Jasper went to pull away Clint was straight onto them, sometimes too close for their liking but that is how Clint races, hard! I kept my distance, always no further away than 15metres from the front paddler, watching, waiting and staying relaxed. At the 16km mark all four of us caught a different run and for the briefest of moments we were all headed in a different direction, really this was the first time in the race where we didn’t cover each other, we each went a separate way. That was all it took, one run, one push and then a continued effort to split the front bunch. From the tight racing that we had had up until that point all four of us were now apart by a distance big enough to work with and try and make a break, and that is just what I did. Nothing too drastic but now more of a concerted effort to keep a higher pace and rhythm. Clint and Dawid went for more of an inside line which in the end was the only way Clint could go due to cramps in his legs. Jasper stayed out with me as I worked hard to pick the best line to the finish. Who had the most left to give it that last push to the line? Jasper races hard and I knew that I couldn’t ease off for a stroke. Every bump that came along I pushed on, every stroke I made, had that little bit more effort to it. 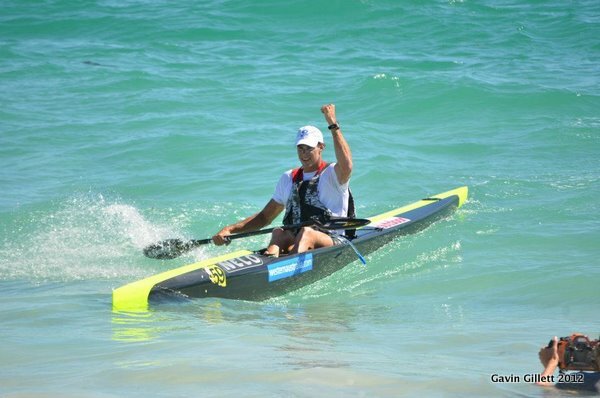 With the finish line so close you don’t want to make any mistakes, because the guys that I am racing are good, they are better than good, they are some of the best ocean ski paddlers in the world and a mistake can make the difference between winning and coming second. Jasper was 100m back and with the beach only 50m away I knew that I had defended my title and allowed myself to celebrate. The feeling of wining the ‘Doctor” world cup for a second year was great especially after such a close race last year with Bruce Taylor (sorry Bruce). I really felt that my paddling ability had improved to be able to win the race by a bigger margin this year. Yeeww! The only decision now….………….What race to do next! Thank you to Nelo surf ski for the XXL boat, Bracsa for my new paddle and to Oceanpaddler for putting on anther great event.